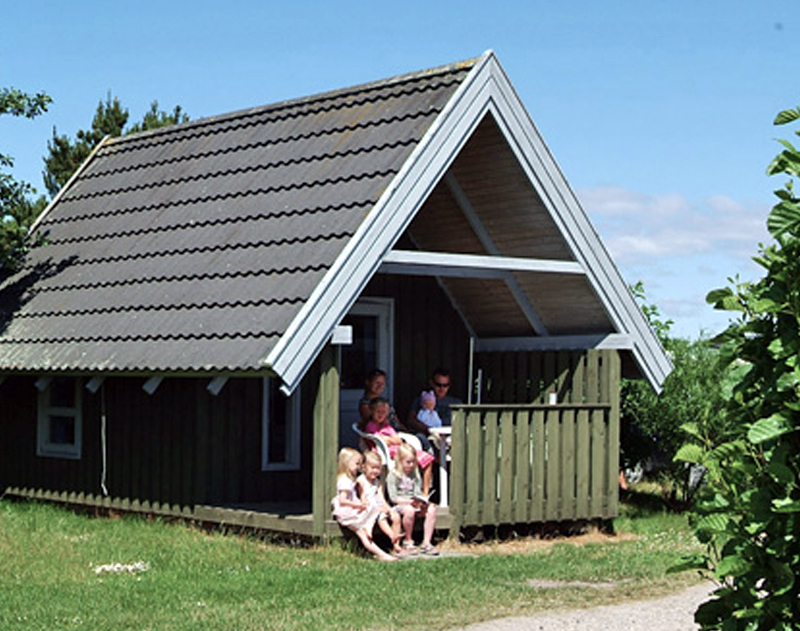 At Rødgaard Camping offer holiday cabins both with /without shower & toilet. 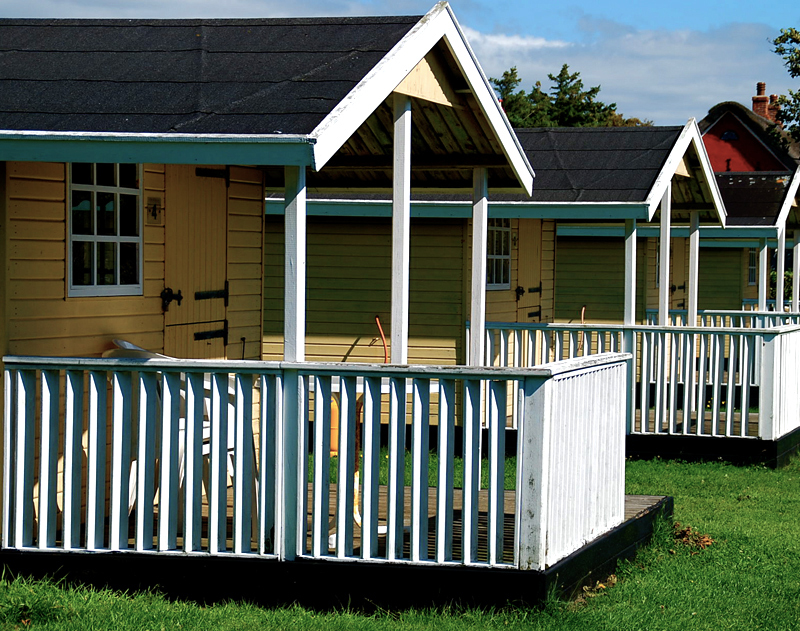 Whether your camping holiday is down to earth or more to the luxurious side, we have the cabin that suits you. 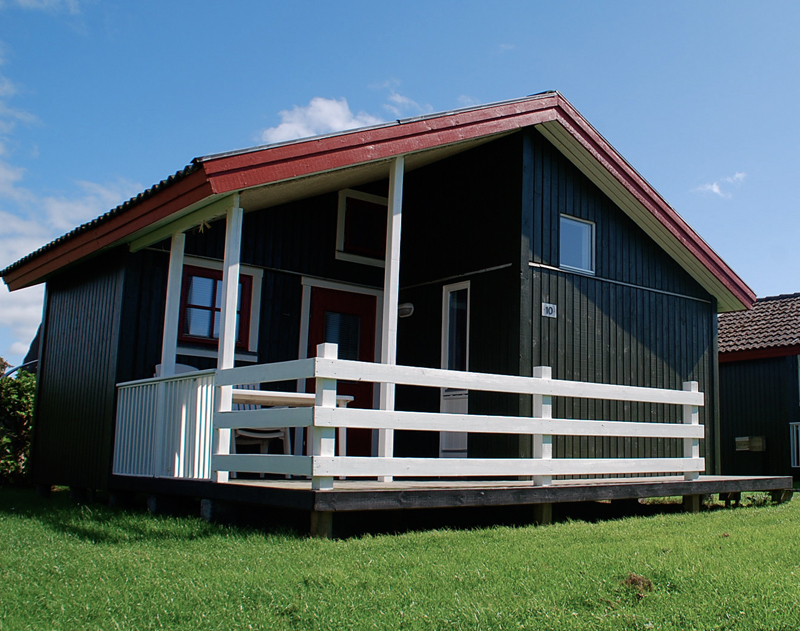 Continue reading and see which cabins we have for rent. NEWS from 2019; Now there are duvets & pillows in all the cabins, you just have to remember the bedding yourself or rent it from us. You also get access to free internet when you stay in one of our cabins. Prices include electricity & hot water. 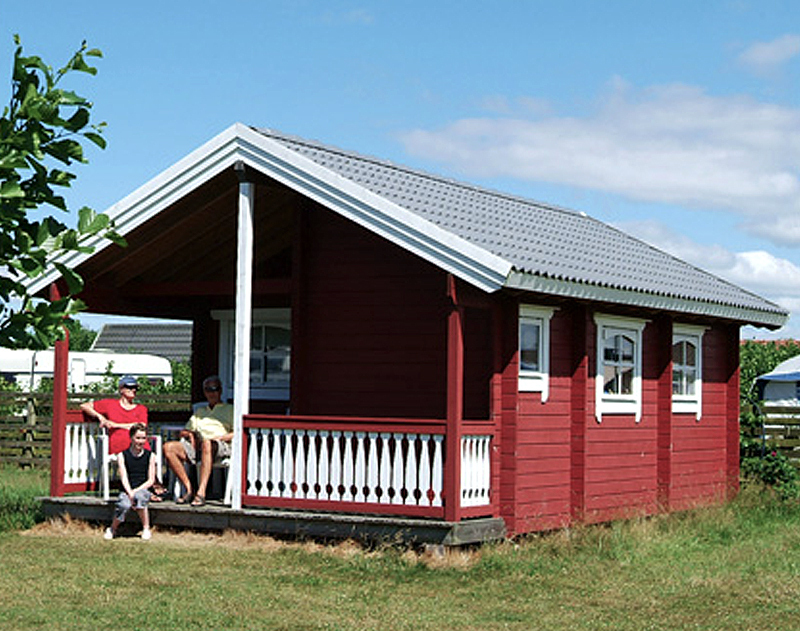 Rødgaard Camping also offers other types of accommodation. 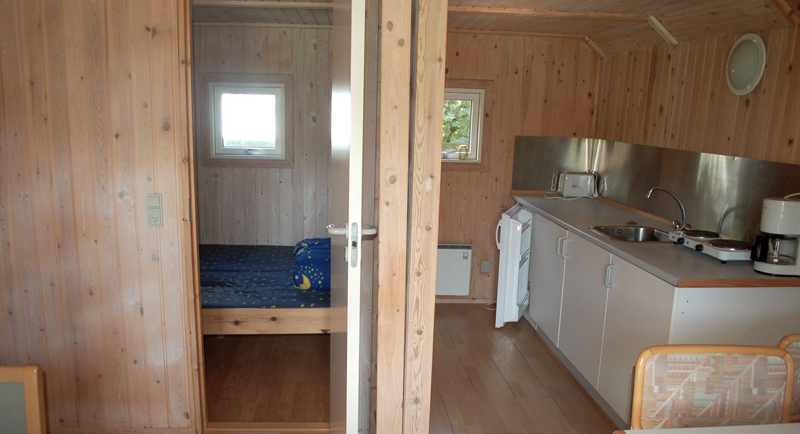 If you want your holiday on Fanø to be in a real caravan, then see our "Landhaus Rosa". Here you get a large, comfortable and very nice caravan, where everything is ready when you arrive. You can also take a closer look at: Bed & Breakfast rooms in Rindbyhus, our summer Annex in the main building or our latest initiative, Glamping Tents. Luxury and comfort, but with a "back to nature" feeling. Simply furnished 1-room cottage at approx. 10 m2. 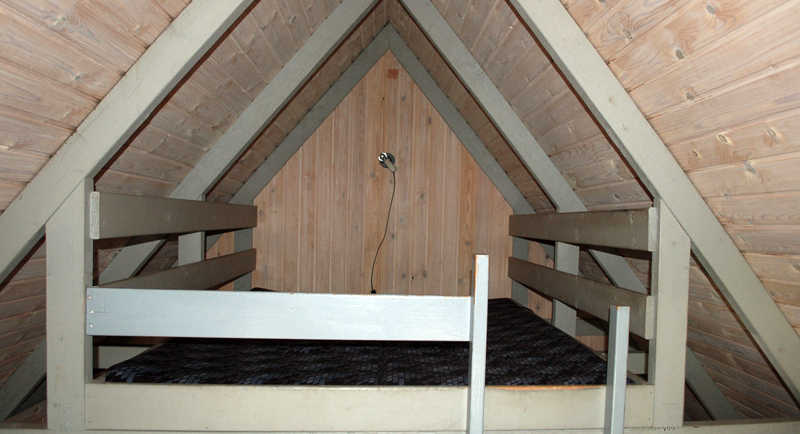 Decorated with 2 narrow bunks and a dining arrangement that can be converted into double bed (180x140 cm.). Duvets & pillows for 3 people. The kitchenette with fridge and double cooking. There is cold water in the cabin. Covered terrace with garden furniture 5 m2. 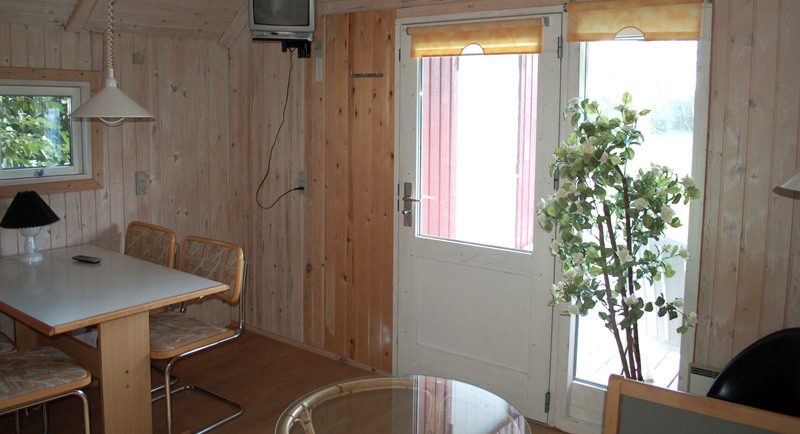 The cabin is equipped with service, cooking utensils and fridge. There is a coffee machine in the cabin. Distance to sanitary facilities: 30-70 meters. Number of cabins for rent of this type: 4 pcs. 1-room cottage of 15 m2. Furnished with ¾ bed, sofa that can be converted into bunk bed plus a small loft. Duvets & pillows for 4 people. Dining arrangement for 4 persons. The kitchenette with fridge and double cooking. There is no water in the cabin. Covered terrace with garden furniture 5 m2. The cabin is equipped with service, cooking utensils and fridge. There is a coffee machine in the cabin. Distance to sanitary facilities: 25-70 meters. Number of cabins for rent of this type: 5 pieces. Cottage with shower and toilet of 25 m2. Furnished with dining arrangement for 4 persons, small loft on the 1st floor with sleeping space for 2 persons. Separate bedroom for 2 persons approx. 10 m2. Duvets & pillows for 4 people. The kitchenette with fridge and double cooking. There is water in the cabin. Covered terrace with garden furniture 7 m2. The cabin is equipped with service, cooking utensils and fridge. There is a coffee machine in the cabin. Older Cottage with shower and toilet of 18 m2. Furnished with dining arrangement for 4 persons, small loft on the 1st floor with sleeping space for 2 persons. Duvets & pillows for 3 people. The kitchenette with fridge and double cooking. There is water in the cabin. Covered terrace with garden furniture 7 m2. Number of cabins for rent of this type: 1 pieces. Comfort cabin with bath and toilet * of 25 m2. Decorated with dining arrangements, small sofa-beds with TV. Separate bedroom for 2 persons approx. 10 m2 with double bed. Hems on the first floor with sleeping space for 2 persons. In cabin 16 & 17 there are duvets / pillows for 4 persons. Kitchen with fridge and double cooker. The cabin is well equipped with service, cooking utensils, fridge. There is a coffee maker and electric kettle in the cabin. Semi-covered terrace of 15 m2 to the south, with garden furniture, Weber Grill and sunbeds. Number of cabins for rent of this type: 2 pieces. Når Rødgård Camping har bekræftet lejers reservation, er der indgået en bindende aftale, og lejer hæfter for hele lejebeløbet. Reservationen er personlig og kan ikke overdrages til andre. Det mellem udlejer og lejer aftalte depositum skal være Rødgård Camping i hænde senest 10 dage efter aftale om indgåelse af lejemålet. Restbeløbet betales ved ankomst. Udebliver depositum er Rødgård Camping berettiget til uden yderligere varsel at annullere reservationen. Skulle lejer blive forsinket eller forhindret i at ankomme netop den dag lejemålet starter, bedes lejer kontakte Rødgård Camping inden kl. 18.00. Ved sidste øjebliks reservation, hvor betalingen ikke har fundet sted, vil campinghytten blive genudlejet efter kl. 16.00, hvis lejer ikke har givet Rødgård Camping besked om senere ankomst. Eventuelle reklamationer vedrørende den lejede udlejningsenhed skal straks meddeles til Rødgård Camping og senest dagen efter ankomst. Reklamationer vedrørende rengøring skal meddeles på ankomstdagen. Lejer er forpligtet til at give Rødgård Camping en rimelig frist til afhjælpning af eventuelle fejl/mangler, som reklameres af lejer.